There is nothing worse than waking up to a foot of snow on the ground and no snow shovel. This year, prepare your family, home, and business before the first snow flies. We all know how dangerous snow can be. Beautiful when it first falls, it quickly can become a hazard to your home, property, and loved ones. Snow that has piled up can make simply walking from your car to your front door difficult. Ice and slush soon follow, which can create a dangerous situation on the roads, in your driveway, on your front steps, and at store fronts and businesses. Read on to learn how you can prepare your home or business for winter weather. Don’t wait until the last minute to purchase a snow shovel. In the fall when grab your rake for the leaves in your lawn, check your home for a snow shovel. Ensure that the one that you have is not broken, and if you need a new one, now is the time to head to the store. 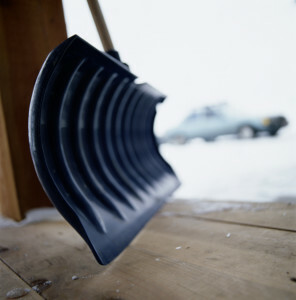 While you are there, pick up a small shovel and an ice scraper, and keep them in your car at all times. If you have a snow blower, be sure that it is serviced and functioning as soon as the weather begins to cool down. Vital for any business owner, and essential for anyone with front steps or a walkway, salt is a quick way to loosen ice and snow on your property. In its pure state, water will freeze at 0 degrees Celsius or 32 degrees Fahrenheit. Salt lowers the freezing point of water, which causes the ice and snow to melt, and prevents fresh ice from forming. Sprinkling rocks or sand on your walkways is always a good idea as well, because it creates traction for your family or visitors to walk on, preventing slips and falls. Don’t wait to make the phone call. Be sure that snow and ice management is arranged for your commercial space long before the first snow flies. If you would like to learn more about commercial snow removal, contact the experts at Greener Horizon for a complimentary consultation. Our team are professionals in both safety and service, and will maintain the mobility and appearance of your property throughout the winter. Whether you have a series of fleet trucks for your business, or a van to bring your kids to school, you want to keep your car or truck safe in the winter weather. Swap out your tires for heavy-duty snow tires, make sure that the oil in your car is the proper viscosity for the winter months, and pack your vehicle with blankets, food, and flashlights. If you would like to learn more winter preparedness tips, or discuss snow and ice management, contact Greener Horizon in Middleborough, MA. Or, learn about how you can care for your property in the winter and early spring by reading our blog at www.greenerhorizon.com.